The Mediator PCI ZIV is designed to be plugged into Amiga's containing the Zorro IV busboard. The Mediator ZIV is in two parts, the first part is the busboard itselds, whilst the second part plugs into the ZIV slot on the Zorro IV busboard. 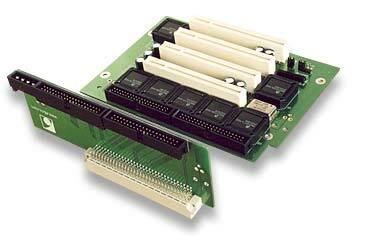 They are connected together by ribbon cables which allows the PCI busboard to be properly mounted in a tower case. Please note that "Zorro IV" has nothing to do with the standard Zorro II and III buses used in most Amigas. It is a custom bus invented by Elbox.